I love sushi. Having lived in LA and NY, I also know what truly melt in your mouth fresh and flavorful sushi tastes like. Surprise surprise, here in landlocked Atlanta, we are not getting fish on par with my former coastal homes. Don't get me wrong, I love Sushi House Hayakawa and frequently enjoy local faves like Zuma (minus the gobs of mayo they normally put on everything), but for truly epic sushi, LA is where it's at. So while the Mr. and I were kickin' it west coast style this weekend, we made a bee-line for an old favorite, Katsu-Ya. Not only did we get our first celeb siting of the weekend (Hilary Duff and Mike Comrie - yes Ms. Duff is still eating sushi while prego), but we also go to enjoy my favorite Katsu-Ya dish, crispy rice with spicy tuna. A symphony of textures and temperatures, this dish is quite simply a party in your mouth. 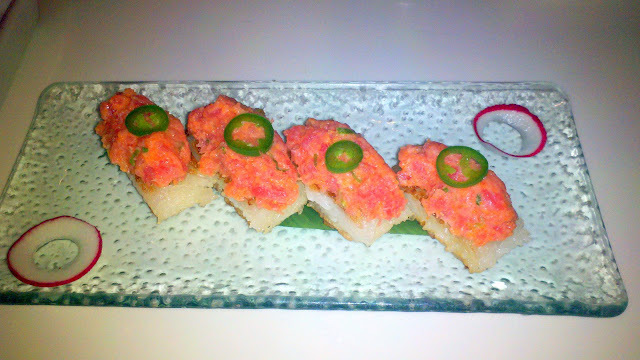 I love the combination of perfectly crispy hot rice, the spicy kick of the jalapeno and oh so fresh tuna. Bliss! Alas, at $14 for just four pieces, it's gone all too fast. Now I'm left to fantasize about it until my next annual westward journey. Oh my, is anyone making this dish in Atlanta? I'm jonesing again already! We went to the Brentwood outpost, but in my mind, for the classic Katsu-Ya experience, you have to head to the valley to their Studio City location.